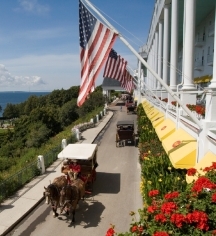 Mackinac Island offers guests a relaxing ambiance where bicycles and horse-drawn carriages are the preferred modes of transportation. Step back to an era of dining to chamber music, Afternoon Tea in the Parlor, croquet on an endless lawn, and dancing the evening away. Enjoy a long list of modern amenities, 18 holes of golf, shopping, Astor's Salon and Spa, or sitting in a rocking chair on the world’s longest porch enjoying the views of the Straits of Mackinac and the Mackinac Bridge. All 386 guestrooms are uniquely decorated by New York Interior Designer, Carleton Varney of Dorothy Draper and Company with One Bedroom and Two Bedroom Suite options available. Grand Hotel, a member of Historic Hotels Worldwide since 2013, dates back to 1887.